Are You a “Knowledge Catalyst”? “Good knowledge catalysts have diverse knowledge networks from which to seek knowledge. These networks are part of their filters. Catalysts also share, adding value through processes such as curation. In addition, and most importantly, they are catalysts in creating and doing something new” (Jarche, blogpost, Knowledge catalysts, 2015-05-11). 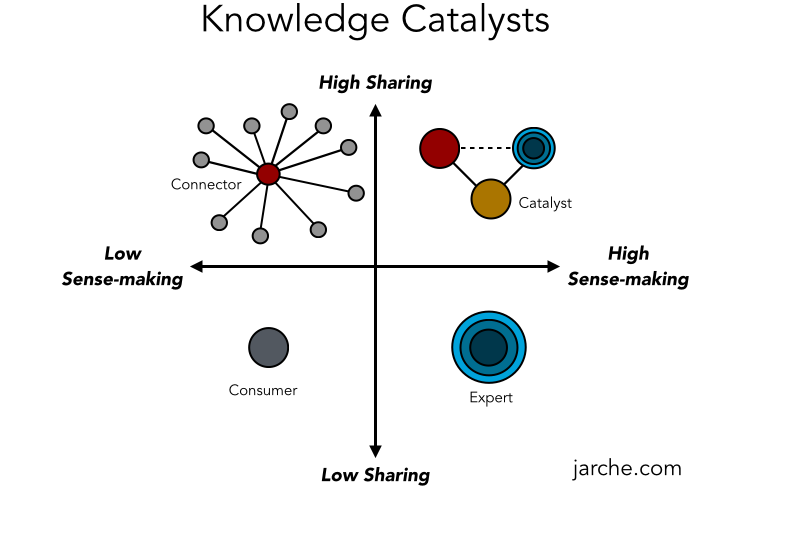 A knowledge catalyst, according to Jarche, values collaboration with others in the generation of new knowledge. This is where the axes in the diagram (see above) intersect to produce both high sharing and high sense-making. “Adding value to information is an important aspect of online communities, where more of us connect for professional development. Active community members ensure that environmental scans are done, connect and converse with other members, commit to ongoing questioning, make suggestions, and help to develop new information tools (e.g. checklists). Knowledge catalysts also help to organize peer-to-peer events that are important to maintain the community” (Jarche, blogpost, Knowledge catalysts add value, 2016-06-09).